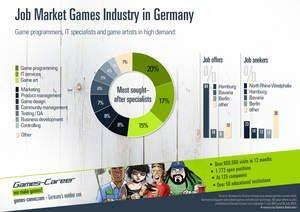 HAMBURG, GERMANY--(Marketwired - Jul 30, 2015) - As the German games industry remains on a growth path and continues to create new jobs, the most highly sought-after professionals are game programmers, IT specialists and game artists. More than half of all vacancies are attributable to these three occupational fields, according to recent analysis by Games-Career.com (www.games-career.com), Germany's leading specialized game industry job exchange. Even if the figures are not representative of the overall market, they nevertheless offer some previously unpublished insight into the job market in the game sector. In addition to current job openings, Games-Career.com provides a comprehensive overview of academic programs at universities and private educational institutions. Games-Career.com is operated by Hamburg-based agency Quinke Networks. During the specified period, 125 companies advertised a total of 1,772 open positions -- a clear indication that the industry is continuing to create jobs. However, the actual, and presumably higher, number of new jobs in the industry cannot be inferred from this figure, as one job posting may relate to several identical vacancies. Likewise, personnel replacement in existing jobs due to natural fluctuation is not recorded, and not every enterprise in the industry publishes open positions on Games-Career.com. 69 percent of the jobs were advertised by developers and publishers, 31 percent by industry-related service providers. In the same period of 2013 and 2014, service providers still represented a proportion of 55 percent, which also partly explains the decline in total job offers, down from previously 2,079. While jobs listed by foreign-based companies are included in the stated figure, they accounted for a share of less than 5 percent. Among the occupational categories listed on Games-Career.com, game programmers continue to be the most sought-after. The strongest gains were recorded in the field of IT. Specializations here include back-end and tool developers, data analysts, administrators and others. Increased demand was also seen for game artists. In contrast, the game designer group (including level designers) showed losses. Rounded figures. Percentages recorded for the same period of 2013 / 2014 are shown in parentheses. Full-time employment is the rule in the games industry. 91 percent of all advertised jobs were full-time positions with social security coverage, up from 88 percent in the equivalent prior-year period. Up north is where career opportunities abound. 64 percent of all job offers on Games-Career.com were placed by companies based in the Hamburg region, followed by Bavaria (10 percent) and Berlin (8 percent). In the equivalent period of the previous year, Berlin was still ahead of Bavaria. As expected, most Games-Career.com users are from the federal state with the largest population, North Rhine-Westphalia (23 percent), followed by Hamburg (14 percent), Bavaria (13 percent) and Berlin (12 percent). In relation to the country's population distribution, interest in game industry jobs in Hamburg and Berlin is clearly above-average, given that the city states represent only 2 percent (Hamburg) and 4 percent (Berlin) of Germany's total population. Interest in Games-Career.com and in game industry jobs remains on the rise. In the period examined, the portal recorded an average of approximately 55,000 visits per month. As Germany's premier resource for game industry jobs, Games-Career.com also provides a comprehensive overview of academic programs offered by universities and private educational institutions (www.games-career.com/Education/). Vibrant communities on Facebook and Twitter are an additional benefit. Games-Career.com is a job portal specifically tailored to the needs of the games industry. The portal is offered in German, English and Spanish language versions. Companies can publish job listings efficiently and cost-effectively, and benefit from additional offers to enhance their profile and visibility while competing for new talent. Job requests by individuals are published free of charge. Likewise, educational and institutions may sign up and present their training/ academic programs free of charge. Games-Career.com is a service provided by Hamburg-based agency Quinke Networks since August 2011. Additional information is available on (www.facebook.com/gamescareer) and Twitter (www.twitter.com/gamescareer). Quinke Networks is Germany's leading service agency for the games industry. Quinke Networks provides single-source public relations and marketing services, business development consulting and recruitment support to games companies and related enterprises establishing or expanding their business. The Hamburg-based, owner-operated agency currently has 7 staff members and was established by Dipl.-Ing. Achim Quinke in Hamburg in 2001.